Last week, Eliza wrote a nice post about the value of professional conferences, and how much she’s learned by attending several of them during her time as a Hubbard Fellow. It’s great to know that she’s getting a lot out of the meetings she’s attended this year. Coincidentally, at the time Eliza’s post came out, I was attending the 5th World Conference of the Society for Ecological Restoration (SER) in Madison, Wisconsin – along with about 1,200 other people from around the world. The conference was big enough that there were thirteen (!) concurrent sessions going on at any one time. Topics ranged from peat moss restoration in Alberta to tiger habitat restoration in Sumatra. The SER conference was well organized and interesting, but very different from most of the conferences I attend – including those that Eliza referenced in her post. I think the SER conference was probably really good for scientists who wanted to get a pulse on the research going on around the world and pick up ideas for future research of their own. However, as someone who actually restored and manages land, my main objective was to find ideas I could bring home and apply to our sites. Because of the size and breadth of the conference, I found it difficult to figure out which presentations to attend; most of the talks were from habitat types other than mine and it was hard to decipher which might have themes that would fit with our work. I ended up spending quite a bit of time in the hallways, talking with other attendees with interests similar to mine – and learning a great deal from them. Wandering around the huge conference center last week made me consider what I really appreciate about the smaller applied conferences and workshops I attend – and often help organize. Here is a list of attributes that I find valuable at those kinds of events. Some of these attributes are probably good for any conference, butI think they are particularly important for those of us directly involved in land management and restoration. 1. Comfortable group size. I like meetings at which I have a decent chance of meeting a majority of participants, or at least knowing something about who they are and what they do. That helps me find people I might want to talk to and learn from, and also makes group discussions possible and effective. I think meetings of 80 people or less are ideal. This year’s Grassland Restoration Network workshop was hosted by the Missouri Department of Conservation. The attendance was strong, but the group small enough that it was possible to meet and talk with a majority of them during the workshop. 2. Narrow Focus. It’s nice to know that a high percentage of presentations I listen to are going to be relevant to my work. Two of my favorite gatherings each year are those of the Grassland Restoration Network and the Patch-Burn Grazing Working Group because both are focused on activities I’m very involved in. While their ranges of subject matter are relatively narrow, both of those meetings include participants from across a large geographic area, with a wide variety of perspectives and experiences I can learn from. 3. Lots of discussion time. At many conferences, presentations are typically limited to 15-20 minute time slots and although presenters are encouraged to leave time for questions at the end, they rarely do. Even when there is time, it’s not discussion time, but rather a couple of quick clarification questions. I like sessions in which there is a short presentation (or two) of thought-provoking ideas or examples, followed by a well-facilitated group discussion that brings out innovative thoughts and questions from audience and presenters alike. Many times, those kinds of discussions generate ideas far different – and more interesting – than what the presenters started talking about. 4. Effective field trips. I learn best when I can see what someone’s site really looks like, and evaluate the impacts of their work firsthand. The best field trips are those during which the trip host takes us not just to places where their work has been very successful, but also where things have not turned out at as they’d hoped. Seeing both the good and the bad, and having honest thoughtful discussions (in the field) about those is incredibly useful, and generates ideas I can bring back home and use. I also appreciate field trips that allow participants to wander away from the vehicles a little and explore, instead of just loading us into vehicles as soon as the host is done talking. Participants of this year’s Patch-Burn Grazing Working Group meeting walk across The Nature Conservancy’s 7-mile Fen in western South Dakota. This was one of two half-day field trips we went on during the conference, and the hosts did a great job of showing us results of their efforts, but also giving us time to explore and evaluate the site ourselves. 5. Plenty of time and space for informal networking. Conferences and workshops I help organize typically schedule plenty of time to just sit around and talk informally. It’s really frustrating to go to a conference that is scheduled from dawn to dusk with events and presentations, leaving no time for getting to know other participants. Much of what I learn from group meetings comes from side discussions during which I can really get to know someone and learn about their experiences. The benefits of that informal time extend beyond the conference as well because I come home with a list of people I can call in the future when I have a question or idea on a particular topic. Informal discussion time, whether in the field or indoors, is often the most valuable part of any conference. 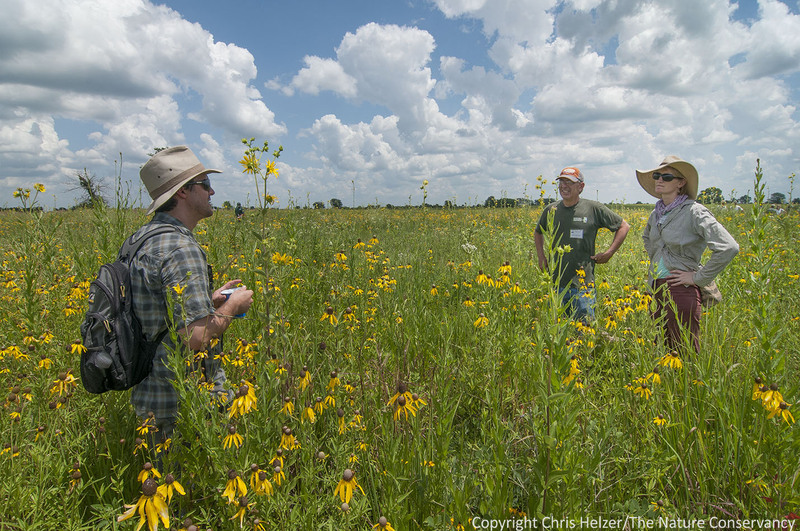 This conversation – during the 2013 Grassland Restoration Network – occurred during some free time on a field trip. 6. Presentations that focus on a lesson or message rather than statistical methods. In graduate school, students are usually taught to give presentations that follow the format of a scientific journal article: introduction, methods, results, discussion. When giving a thesis defense presentation to get your degree, that’s probably appropriate. However, at a conference with others who want to learn about your project, spending most of your allotted time talking about how you set up your project and analyzed your data is worse than useless. The most useful presentations focus on the results and how they fit into the larger context of a topic. If I want to know what statistics you used to analyze your data, I’ll ask you at another time or read the publication you’ll eventually write. Tell me what you learned and why it’s interesting and important. 7. An accessible price. When I help organize workshops and conferences, keeping the cost of attendance down is a top priority. Most of the attendees at our meetings are land managers or scientists that work for state agencies or non-profit conservation organizations, and both money and time are tight. It’s hard enough to convince people to leave their sites and task lists for a couple days. Making them pay high registration fees in addition to hotel and travel costs is an unnecessary barrier to their attendance. We can’t do anything about travel costs to get to the meeting, but we work hard to find conference centers and lodging options that are low cost. Often, those lower cost meeting locations tend to facilitate better informal interactions anyway. I was grateful for the opportunity to attend the SER conference in Madison last week, and I got the chance to meet some new friends and catch up with some old ones. However, the conference also gave me a chance to compare and contrast meeting styles and think about what attributes are important to me. I’m curious to hear what you think on this topic. P.S. I have one request to anyone who talks about ecological restoration. Can we please agree to stop using the phrase “If you build it, they will come”? 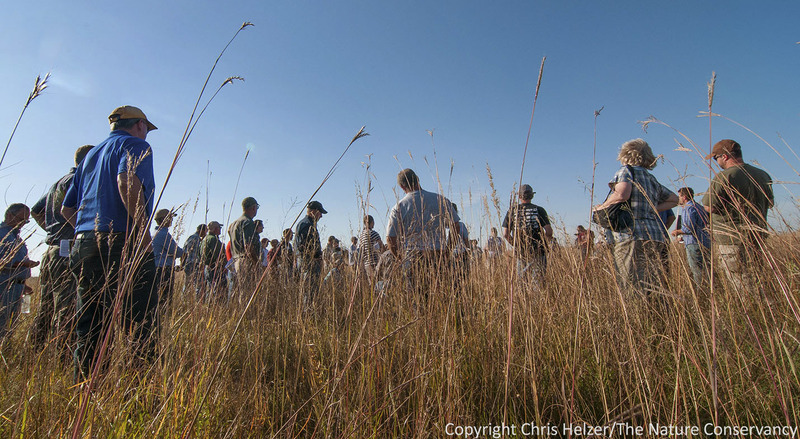 This entry was posted in General, Prairie Management, Prairie Restoration/Reconstruction and tagged conferences, effective, grassland, grazing, land management, land steward, meetings, prairie, restoration, what makes a good conference by Chris Helzer. Bookmark the permalink. Yes, I heard more than I really wanted on experimental design and statistical analysis at SER. I do think that’s how students are taught to present their work, but it ends up hiding whatever the actual research found and why it’s important. It does seem that more experienced researchers know how to minimize that part of the talk and really focus on the big message – but it’s something you only learn in time. I will say that my biggest frustration at the conference were talks with provocative titles that didn’t deliver. In one case, zero data had been collected but the title suggested that there was a novel way to attack garlic mustard. People packed the room to hear the talk only to find out the author was a grad student who just thought it was a neat idea and planned to collect some data about it. There were muttered expletives as everyone filed back out of the room. Cost of the conference are a major factor to me since I am paying my own way. The protection and restoration of the natural world is my avocation not my profession. I enjoy conferences were I can learn how to become a better volunteer and many time that mean talking to the experts in the hallway between sessions. I am also energized by meeting other volunteers with a passion for this work. I can not write a big check to my favorite NGO but I can show up in the field with my work gloves. Some of the presentations at the larger conferences wind up being screen shots of papers that could be provided electronically or in hard copy, without taking sessions time. With so many decisions to make about which sessions to attend, it’s unfortunate to make a choice that turns out to be the author reading the text on the screen. It might also be worthwhile for organizers to give more thought to the way the “tracks” are categorized. Thanks for this post, Chris. It was really timely for me because I spent the better part of yesterday afternoon surfing through a conference website, trying to figure out where I should be and when. I agree whole heartedly, Chris. I gave up on major conferences like MW F&W and North American Prairie years ago because I tired o wasting my time listing to project design, statistical analysis, scientific nomenclature and metric measurements (which I spent most of talk mentally converting) only to have few results and conclusions. PBG Working Group, Prairie Grouse Technical Council, and a few others are better than a vacation to me and use of my pocket money. I didn’t get to the Grassland Network meeting in part because of the out-of-pocket costs and being torn because I knew I would disagree with several of them about the role of Prairie Fork (how valuable are museum specimens?). Thanks for the great post. Good seeing you at pbg working group and look forward to being there next year. After your teaser in Eliza’s earlier post that you would have more to say regarding conferences, I was looking forward to reading what you would have to say. To echo other commenters, it is a challenge to decide which talks to go to at large conferences with multiple tracks. The expectation I form from a title doesn’t always match the reality once the talk is underway and also a presenter’s style has a big impact on how useful and interesting their talk ends up being. The schedule of talks for the past 2 conferences I attended (one day each, to manage the expense, of SER 2013 and Natural Areas Association) were also affected by the shutdown that prevented federal employees from attending. The choice by organizers to bump up all the presenters in a track with a cancelled talk rather than keep to the printed schedule was frustrating since it meant I missed several talks that I hoped to catch. I considered going to a few talks outside of the temperate grassland realm: aquatic habitats, neotropical forests, American chestnut, etc. to see what that would be like, but ultimately only went to one like that. It was interesting to me. It dealt with distribution of guilds of wind-dispersed and animal-dispersed species between remnant, re-planted and cleared-then-allowed-to-go-through-succesion-on-its-own tracts of forest. I also wondered if I were working in American chestnut restoration, or oysters, or reefs, would I choose to attend the big global SER conference just for a 2-hour track? I did meet new people and have good conversations in the hallways. It is good to have a diversity of conference types to choose from, and knowing what to expect and how to participate at each type helps to have a worthwhile experience. These are excellent points, Chris. I returned to this SER conference after a long break, maybe 9 or 10 years. I joined in 1990 and was briefly on the board. SER has struggled since its inception with the dual role of practitioner support and platform for academic research and career advancement. A third competing strand is focused on definitions and philosophy–like the multiple sessions this year on Novel Ecosystems. And then there is the whole landscape architecture tribe! I have mixed feelings about the methods and data-heavy papers, and papers dealing with ecosystems outside my region. On the one hand I enjoy the luxury of learning about other ecosystems and appreciating good experimental design. Some of these ideas may come in handy some day (emphasis on “some”). Some researchers wield the cumbersome stats more gracefully than others, for sure. On the other hand, I become impatient with presentations where “we tried this and it worked great” without any details to convince me there was some kind of objective assessment–much less deluxe statistics. Overall, SER members are an awkward and unwieldy bunch to please. I agree with you that the more focused, discussion and field trip centered meetings are the best. Currently, there is no regional chapter for the Great Plains and Iowa but I think the Midwest/Great Lakes chapter meetings would be more satisfying. Maybe we need to start a new chapter for our region– Or would this be unnecessary duplication? “If you build it, they will come”? Hi Chris, I have not heard anyone use that phrase when talking about ecological restoration. To what are they referring? Is it some sort of reminder to do a couple seasons of weed control before embarking on a restoration project? Hi Chris, The questions were rhetorical. I was commenting on the outcomes of the many restoration efforts I have helped with over the years. The unsatisfying result being most of my time gets put toward controlling dominating species. I attended the SER meeting with four undergraduates, and we had a great experience. It is true that big conferences are a vastly different world than smaller meetings, but they offer different advantages. For instance, one of my students is interested in marine biology, and she was able to attend talks on marine restoration while I learned about prairies in the adjacent room. Additionally, we heard speakers who work for the UN and listened to talks describing restoration efforts around the world. For both me and my students, these talks provided us with different perspectives AND got us excited to know that people all around the world care about nature. While I do not disagree with anything that Chris and others have said, I like to attend (and take students to) meetings of all different sizes. Hi Russ! I saw you across the room in one of the sessions, but wasn’t able to catch up to you later. Great points about the advantages of a broad meeting like that – especially for giving students and young professionals a feel for all the various aspects of restoration ecology. Kudos to you for giving those kids that experience. As a professional “presenter” (Interpretive naturalist) I find most conferences roughly the equivalent of nails on a chalkboard. Unfortunately, the majority of scientists never receive any training in presentation/communication skills so you end up sitting in a lecture-style presentation watching the back of the presenter’s head while he/she reads their tiny-text heavy powerpoint slides practicing what they learned in high school: “tell ’em what you’re gonna tell ’em, tell ’em, and then tell ’em what you told ’em”. Any conference with published, or in the process of publishing, papers should have them available in electronic format from either a central computer at the location or a website or via email or whathaveyou. Copies of presentations, recommended reading, etc can all be communicated the same way. With that being said, I love sitting through a Chris Helzer presentation; you never know what new pictures are going to pop up.